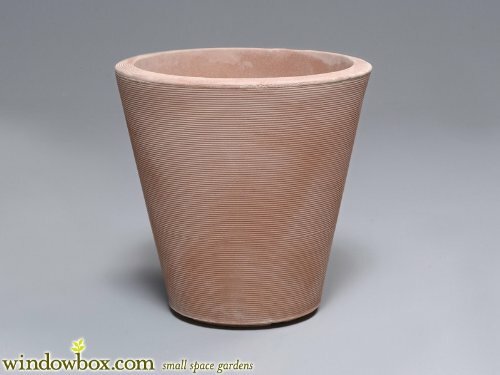 Madison Planter Lightweight Elegance Our lightweight planters are hand crafted through an exclusive eight-step process. Using only the highest-grade resin and innovative technology makes these planters lightweight and incredibly durable. The exclusive Anti-shock manufacturing process provides years of enjoyment. Weatherproof & UV-Protected Pre drilled drainage holes Deep Inner Lip Enhances Durability Lightweight and incredibly durable Height & width of all planters match: 14"H x 14"W 16"H x 16"W etc. About Crescent Crescent Garden recreates the fine detailing of hand crafted garden ornaments and planters in an ultra resistant lightweight resin. With designs from the romantic Mediterranean classics, to the clean lines of contemporary design, there is an accessory available for every garden.Crescent Planters are easy to handle and convenient to install.Manufactured with an extremely resistant resin, our crack proof planters provide years of enjoyment.They will never crack in winter or fade in summer.Our pre-drilled drainage holes save you time, and Crescent Garden backs up all of its products with a 10 year warranty. If you have any questions about this product by Crescent Gardens, contact us by completing and submitting the form below. If you are looking for a specif part number, please include it with your message.